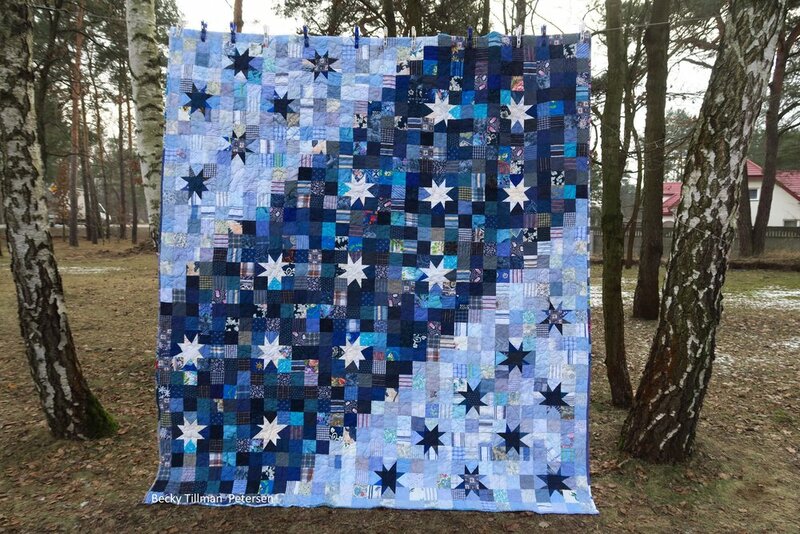 I was able to get Starry Night quilted! It was number 11 in my "Upcycled Blues" series. I'm finishing these in no specific order, BTW. I quilted it with an all around design using stars and loops. I had debated several things but finally decided on this design. Right up until I was almost ready to start I was undecided as to how to do it. I know that makes it sound like I actually had a deadline, which of course, I didn't, but what I meant, was, I was on the way up the stairs with it in my hands when I finally decided what to do. That's good. I suppose sometimes I actually get to the machine and then decide! It's a rather big quilt, so my original thoughts were a bit overwhelming (diagonal straight lines) and I tossed them out as not very feasible. I thought I COULD make it work, and then I thought..okay..what about the stars - go right through them or try to go around them? I decided I wasn't up for that. Once I decided on the stars and loops, having done it before, I had courage that I could do it again. 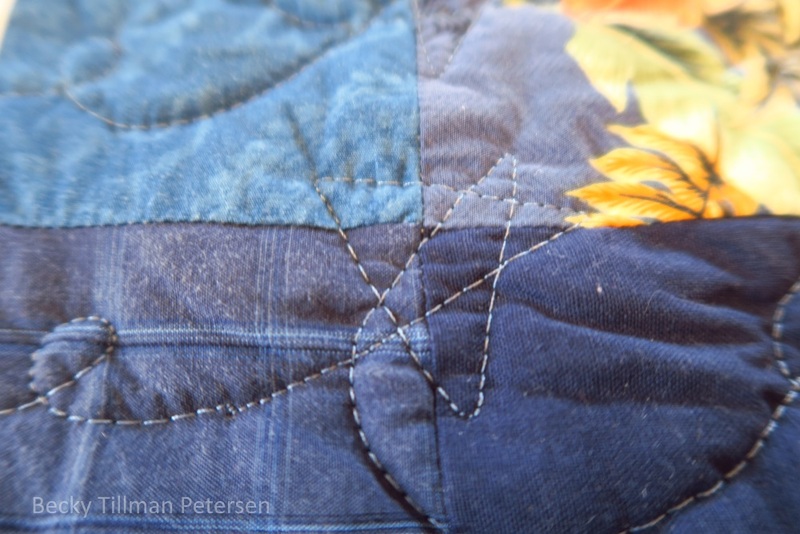 It's not that I don't think I can do a certain quilt design (ha ha - actually I do have that fear - ), but it's esp. true on a quilt 95"x105" or so. What is not difficult on a 50"x50" or a lap size, is quite another matter on one so big. Just the volume of fabric to be pushing under the machine - even one with over an 11" throat - it's still a big task. But in the end, I'm satisfied enough with it. Of course, it could be better - it could always be better. But I'm definitely in the "finished is better than perfectly unfinished" camp. And once again - who among us doesn't like a quilt roll? I think they look so nice - and it represents all that work - literally "all rolled up". Here's a bit of a close up view of the top part. I'm determined to try to show you the backs of all of these upcycled quilts if I can manage to remember to get a picture of them. Here the shadow of a tree is making part of it darker, but since it's the back, I'm not worried about it. I used a duvet cover (the circles - I bought it locally at the second-hand shop, but it was originally, some time ago, from Ikea) and the flowers were curtains, if I remember right. This was the second photo shoot today for this picture. The first time it was earlier in the day and there was too much light at the top edge, so I went back out about 3:45 pm and got this picture. 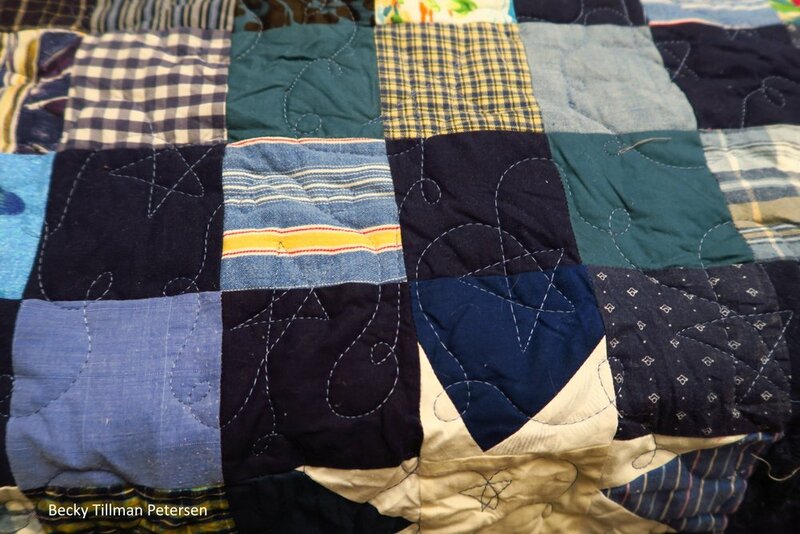 I got the quilt flipped - end for end, so if it seems different to you here than in the above pictures, that's why. But this time the picture turned out nicely so I'm going to use this one. 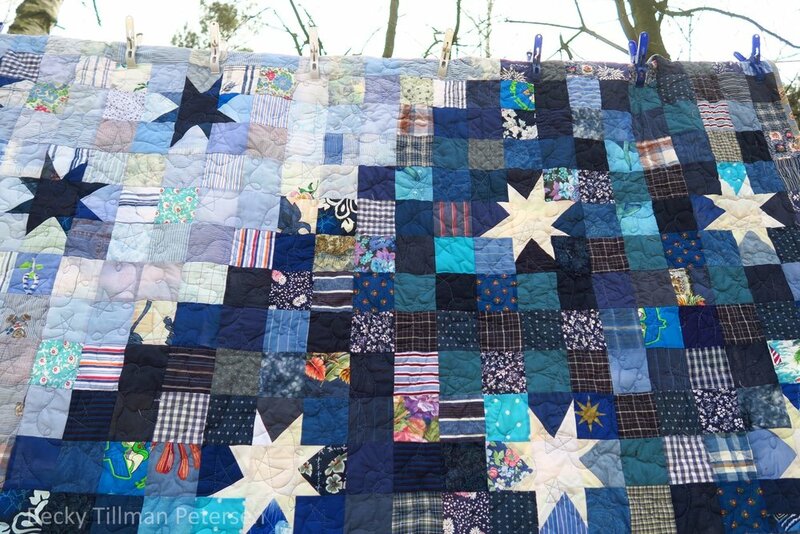 The picture of the whole quilt from the earlier in the day shooting wasn't as good - it was washed out looking at the top. So here it is - from all upcycled fabrics except for the thread and the batting. The snow you see in the background on its way out. It actually warmed up to above freezing today. I'm so thankful it was warmer! Oh, and I did update the free pattern with new pictures.